For nearly 70 years, Plantsville Pharmacy, located at 1 W. Main St. in the Plantsville section of Southington, has possessed a relatively simple prescription for success. 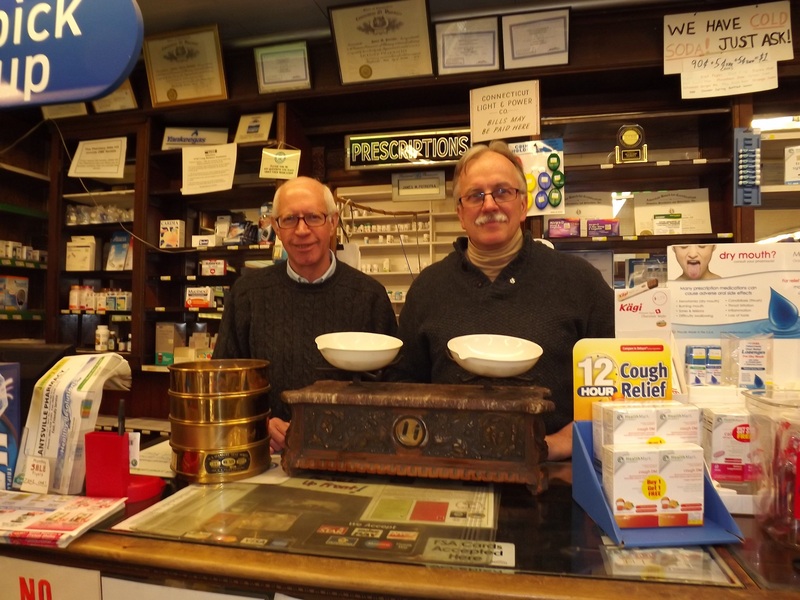 Although cousins James M. Potrepka and Chester A. Potrepka Jr., co-owners of the pharmacy, have introduced different products and services to store customers over the years, one thing hasn’t changed — personalized service and being able to follow through to help customers. “Doctors and customers are amazed the pharmacists and owners answer the phones,” Jim said, adding that in today’s competitive, technology-supported business climate, people who are telephoning usually get automated phone systems with voice mails or telling them press this key if you want customer service. 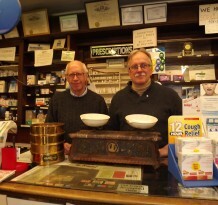 Cousins James Potrepka, left, and Chester Potrepka Jr., co-owners of Plantsville Pharmacy, show an antique balance weighing device that their fathers used when the pharmacy was established in April 1946. Now one of the oldest commercial businesses in downtown Plantsville, it will celebrate its 70th anniversary in 2016. Jim’s father, Frank Potrepka, and Chet’s father, Chester A. Potrepka Sr., founded Plantsville Pharmacy in April 1946 after the senior family members and pharmacists who were brothers purchased the business known as Hallahan’s drug store, located in downtown Plantsville since the Great Depression era. Also involved in part of the business was Bernadine Potrepka, who was the sister of the older Potrepkas. It was a real family affair, according to Jim and Chet Jr., with many relatives and their friends working at the drug store over the years. Originally, a soda fountain and counter with stools bolted to the floor were located in the pharmacy. Chet Jr. and Jim, who both followed in their fathers’ footsteps, said it wasn’t unusual for local drug stores to have an ample lunch counter or soda fountain, where customers could enjoy a banana split, milkshake, cherry soda or ice cream cone while waiting for their prescriptions to be filled. However, the counter area and soda fountain were removed around 1970, allowing more space for other products. 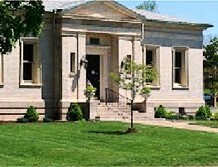 Both cousins earned their degrees from the University of Connecticut School of Pharmacy, eventually becoming local, registered pharmacists, with Jim graduating in 1970 and Chet Jr. graduating in 1977. Jim immediately went to work in Plantsville. Chet Jr. started working as a pharmacist at the former Arthur’s Drug Store in Hartford. At the time, there weren’t the numbers of chain drug stores that exist today. Most pharmacies were mom-and-pop, independently-owned businesses. Most towns had one or two drug stores, while Southington had many such businesses during the past century or so. In addition to Plantsville Pharmacy, other mom-and-pop drug stores included Southworth’s, Center Drug, Oxley’s, Chafee’s, Serafino Pharmacy and Keith’s. 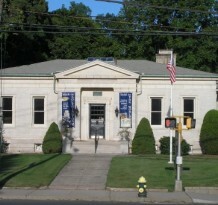 The old drug store near the southern part of the Town Green was owned by Steve Chafee. Originally located where the American Legion Post is today, it burned down in 1935 and moved to the new building erected in the mid-1920s at the corner of Main Street and Berlin Avenue. That building today is named in honor of longtime Southington Health Director Dr. George Gura. That pharmacy business later was purchased by Bob Flynn and moved to a building across from Eden Avenue. Jim and Chet Jr. are adamant that Plantsville Pharmacy will be around to celebrate its 70th anniversary in 2016. They have made some changes to the business, the biggest being affiliated with HealthMart, a consortium of independent drug stores that have banned together for help in buying and distributing medicine and products in bulk. Both men said one of the new services involves “e-prescriptions via computer” that can be filled through arrangements with physicians and other medical doctors. 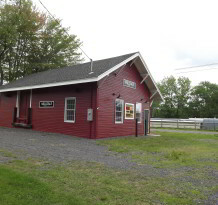 However, Plantsville Pharmacy has retained its old-fashioned service and work ethic begun by the senior Potrepkas. Chet Jr. proudly showed some old equipment that was stored in a back room, including an antique balance weighing device from the late 19th century, and old apothecary medicine jars still on display above the front prescription counter. Jim and Chet Jr. said that if their fathers and aunt were alive today, they probably would be pleased the pharmacy is nearing its 70th anniversary. Jim, 67, and Chet Jr., who is in his 60s, predict the drug store and business will be around for many years to come. Both are somewhat optimistic at the news of a “renaissance project” similar to one completed a few years ago in downtown Southington may be started soon for Plantsville. 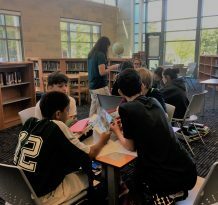 While Jim said he is looking forward to seeing vintage streetlights, old-fashioned benches and bricked sidewalks and crosswalks erected, he hopes the on-street parking situation isn’t made worse with a complete redesign. 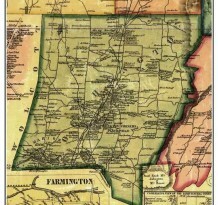 Plantsville has remained successful because of its varied businesses, including antique shops, restaurants and other firms, Jim said.